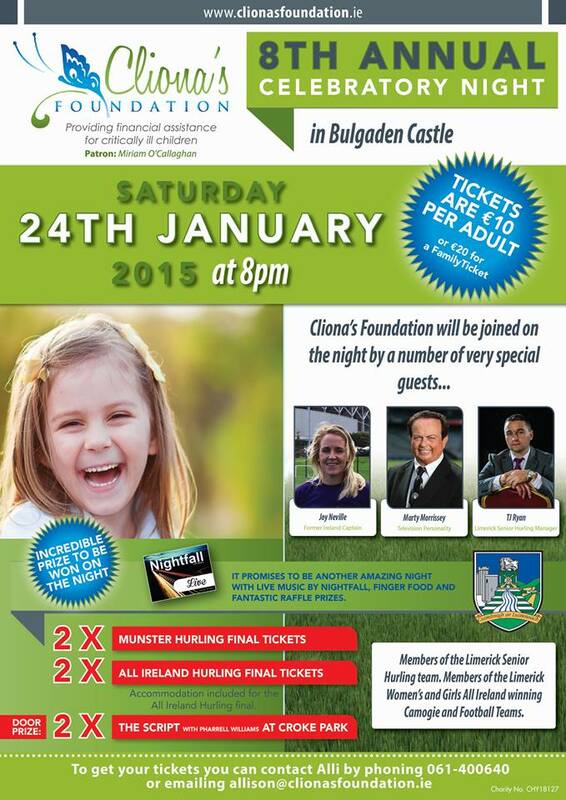 We are delighted to announce that Cliona’s Foundation’s 8th Annual Celebratory night will take place on Saturday the 24th January 2015 at 8pm in Bulgaden Castle. • Members of the Limerick Women’s and Girls All Ireland winning Camogie and Football Teams. 2 x Munster Hurling Final tickets and 2 x All Ireland Hurling Final tickets with accommodation included for the All Ireland Hurling final. And for everybody who comes on the night there is a special door prize of 2 x tickets to see The Script with Pharrell Williams in Croke Park. It promises to be another amazing night with live music by Nightfall, finger food and fantastic raffle prizes.